NEW YORK, Feb. 3 (Xinhua) -- The southern Chinese city of Guangzhou has amazed New Yorkers with its unique festive traditions through blossoms and delicacies, as a flower fair carnival and story forum was held on Saturday. The event, called Overseas Spring Festival Flower Fair Carnival and Guangzhou Story Forum, focused on introducing Guangzhou's time-honored tradition of hosting Spring Festival flower fairs and Cantonese food. It was also part of the city's global road show activities in 2019. 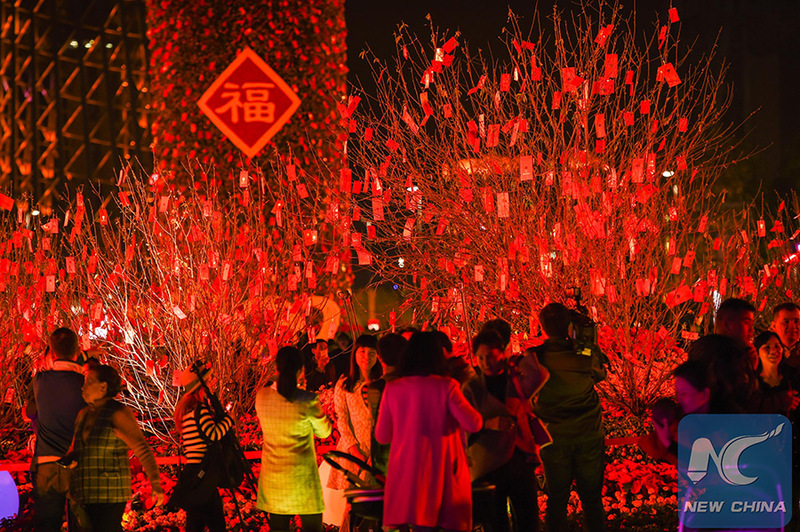 "Guangzhou Spring Festival flower fair, which dates back to more than a thousand years ago, is indispensable for local residents to celebrate the Chinese Lunar New Year. We hope to promote this unique tradition to overseas people and let them know more about Guangzhou, the Flower City," said Xu Bei, the event organizer. Saturday's event also included interactive games such as learning Cantonese and recognizing various types of dim sum. "It's amazing that I'm able to say 'Happy New Year' in Cantonese. Also, it's the first time I got to know the different meanings of the flowers according to Guangzhou customs," said Sarah Siskind, who comes from the U.S. state of California and now works in New York. For 23-year-old Su Zicong, a student from Guangzhou who studies at Columbia University, it is the fifth year that he has not been able to go back home during the Spring Festival. The event helped cure his nostalgia, he said. William H. Su, chairman of the Myanmar Chinese Association of New York Inc., said such activities are also significant in helping overseas Chinese, especially the young generation, learn and inherit the traditions of the Chinese New Year. The interaction between Guangzhou and New York has been increasingly frequent in recent years. In 2017, the southern Chinese city's promo video "Guangzhou, Flower City in Bloom" was displayed on the screen at New York Times Square, while in 2018, New York won the 2018 Guangzhou International Award for Urban Innovation. Indeed, Guangzhou, with a history stretching back to more than 2,000 years ago, is aiming to become a global city by integrating itself with the rest of the world. On Jan. 23, Guangzhou held its first international road show this year in Davos, Switzerland and presented itself at the World Economic Forum Annual Meeting. On Jan. 25, the city showcased its glamor through delicacies in the French capital of Paris.